I really didn't know what to expect from Daughter of Smoke and Bone other than hearing that it was absolutely amazing from everyone I talked to. I was worried that DoSaB wouldn't live up to the hype, but oh my goodness it totally surpassed anything I could have asked for! It was like a trip to Prague (and a few other places) because Taylor's writing was so vivid! I loved the main character, Karou! She was intelligent, brave, funny and artistic. She was the perfect main character for this story and I cannot wait to get to know her even more in the sequel! She was brought up by Brimstone and his fellow portal dwellers known as the chimera (devil side). It was really interesting to see how Karou interacts in both worlds: going to school and then running Brimstone's errands. Every supporting character was thoroughly developed and really added something special to the story. Whether it was Karou's eccentric ex-boyfriend Kaz, out-spoken Zuzana or they mysterious creatures from Karou's other life like Brimstone or Issa. I seriously loved each character introduced, even the villains I loved to hate! The main driving force of this book was the incredible plot. I loved how I was introduced into Karou's world slowly and got a glimpse of her old life before everything was turned upside down by these mysterious hand prints on doors. I honestly had no idea what was going to come next! I had so many predictions and was just completely blown away by all the twists in the story. The ending and everything leading up to it was ah-mazing. Just, wow! A little over half way through the book things kind of turn completely away from the story that was being told, but it still has to do with the progression of the story. I thought I wouldn't like that aspect, but ended up loving it! "Hope? Hope can be a powerful force. Maybe there's no actual magic in it, but when you know what you hope for most and hold it like a light within you, you can make things happen, almost like magic." 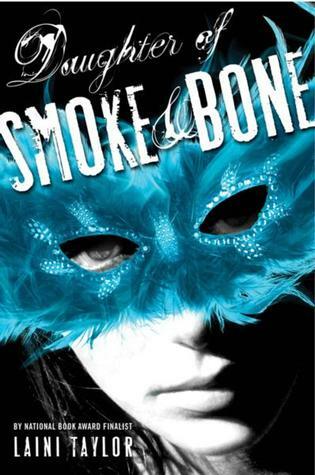 Daughter of Smoke and Bone was perfection. Taylor's writing was the perfect mix of description, teenage voice and everything awesome. I cannot wait to read book two, Days of Blood and Starlight! Glad this one lived up to the hype for you. I still need to pick up the second to find out what comes next! I LOVED this book as well. I was skeptical and did not want to pick it up but boy was I blew away. The only problem I had with this book was around page 200 it seemed misplaced. Luckily, Lani picked it back up and had a banging ending! You should def. read the next installment. It is better then the first! Hey Sarah Elizabeth! I definitely will read the second book! I can see where it would have gotten confusing, I had to reread some parts! Hey Bookworm, I can't wait to pick up the second one, I hope you like it too! Hi Purple Equation, So happy that you loved this one too! Definitely agree, totally blew me away as well and you're totally right about around page 200! Also SO happy to hear that the second is better than the first!!! Oh I'm so glad you loved it :) You're right about the trip to Prague - I'd never even thought about that country, but after our virtual trip there, I really want to go! Days of Blood and Starlight is even more amazing! !